Lovers of the old west will love this animated pokies game from NextGen Gaming, where cowboys, saloon mistresses and horses gather in dusty bars to get on the hooch and play a few rounds of poker. Wild West is a cracking good time, so leave your worries at the saloon door and join the fun on this awesome online pokies game, which is available at some of the Internet’s leading real money casinos. 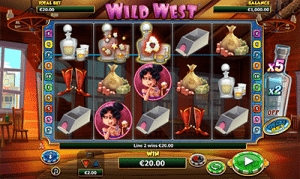 Wild West is a five-reel, three row pokies game with 10 fixed paylines. It comes with a theoretical return to player (RTP) of between 95.31% and 95.86%, which is on the lower spectrum of online pokies, but still provides better odds than a land based pokie machine. There is no special skill or strategy required to play Wild West pokies. Simply set the value of your bet by selecting your coin value using the arrows at the bottom of the reels. Coin sizes range between $0.01, $0.02, $0.05, $0.10, $0.20, $0.25, $0.50, $1.00 and $2.00. You can watch as your total bet increases or decreases at the top of the screen so you know how much you’re choosing to bet per spin. The minimum bet in Wild West is $0.10, with the maximum bet set at $20 when the Super Bet feature is turned off, or $100 max when the X5 Super Bet is activated (more information on this below). You can try it for free in practice mode at our recommended casinos, or sign up for an account and make a real money deposit to start playing for real money wagers. Wild West is an instant-play pokies game, so you can play directly over your Web browser with no downloads required. Wild symbol – The wild is the cowboy symbol, which appears on reels three, four and five only and substitutes for all other symbols to form a winning combination except the scatter chip stack. In an unusual twist, the wild is responsible for triggering the free spins bonus. Scatter symbol – The scatter is the Wild West casino chip stack, which only appears during the free spins bonus. Free spins bonus – An appearance of the cowboy wild symbol in any winning combination results in five free spins. Free spins can be re-triggered at any time with the appearance of the scatter chip stack awarding an additional five free re-spins. All free spins are played on the value of the current bet in place. Super Bet feature – Wild West uses the unique NextGen Super Bet feature. This is an optional additional wager that can be adjusted by clicking on the bottle on the right hand side of the reels to enable a 2X or 5X bonus multiplier. When the Super Bet is enabled and you’re playing 10 paylines at 40 coins, all wild wins are multiplier by five, and when playing 10 lines with 10 coins, all wild wins are multiplier by two. 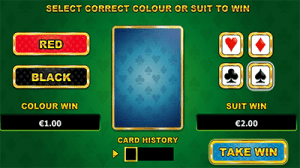 Gamble feature – The game comes with a classic gamble feature, where after every standard win you can choose to click the heart/club casino chip at the bottom of the reels to risk your winnings for the chance to double your money. Select the colour or suit of the face-down card for your chance to increase your win, or lose it all. NextGen (which operates as part of the NYX Gaming Group) pokies are tougher to find when playing online, but thankfully two of our top-rated online casinos offer Wild West along with a selection of other entertaining NextGen and NYX titles. Our number one favourite is Slots Million, which offers a haven for pokies enthusiasts, with over 1800 instant-play titles available from the best gaming studios in the business, including NextGen. On top of their solid reputations and safe deposit options offered to real money players, these casinos get our recommendation thanks to the huge welcome bonuses they offer to new players. Sign up for an account using our links and you can claim some awesome matched deposit bonuses and free spins, with instant access to loyalty reward programs. Wild West really nails the fun, kitschy vibes of the old west, topped off perfectly with a Western soundtrack and sound effects like cowboys yelling “yee haa!” and whips being cracked. It’s these little details, along with the awesome saloon backdrop and cool looking symbols that make this game what it is. In addition, the free spins bonus, gamble feature and optional Super Bet side wager amp up the action levels, making this a great addition to NextGen’s impressive pokies catalogue. Give Wild West and other NextGen pokies a try for free or real money bets at Slots Million and claim a matched deposit bonus to use on a large selection of NetEnt’s hottest pokies.